As the USS George Washington made its way from its forward deployed base in Japan back to its birthplace of Norfolk, Virginia for a complex overhaul, the supercarrier and Carrier Air Wing Two circumnavigated South America. The video below, which is packed full of breathtaking footage, documents the Bounty Hunter’s perspective of this historic cruise. The George Washington’s cruise from Japan to Virginia was part of carrier swap that saw three Navy flattops switch bases nearly simultaneously. Once the George Washington has received its complex overhaul it will fight on for another twenty five years. 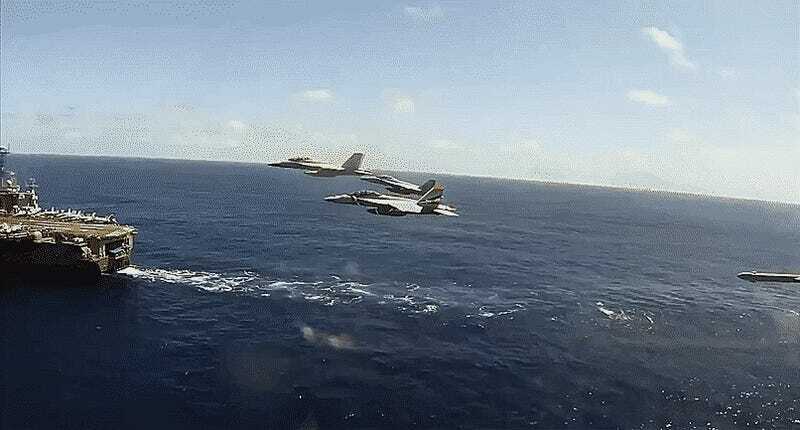 As for the Bounty Hunters and their Super Hornets, well they just keep doing what they do, which is being both awesome and deadly.